On the morning of October 30th, 2001, Hemp US Flags, sponsored by Fuel and Fiber Company, were presented to Arizona State Senator Darden Hamilton and Arizona House Representative Dean Cooley. In fact, when all forms of hemp were made illegal in the early part of the last century, it was used in the majority of the prescription drugs then sold in America. That was certainly no accident. Those who favor the use of what is now called "medical marijuana" recognize these strong medicinal qualities. But marijuana and the medical or recreational varieties of cannabis are not really at issue today, because science readily allows us to distinguish them from industrial hemp by simple tests for the huge difference in the potency of the plants, i.e. the percentage of the psychotropic ingredient: delta-9-tetrahydrocannabinol ("THC"), the active psychotropic ingredient found in the leaves and flowers of the female plant, but not in her seeds or stems. Two cannabinoids are preponderant in cannabis: THC, the psychoactive ingredient, and CBD, which is an antipsychoactive ingredient. Marijuana is high in the psychoactive cannabinoid, THC, and low in the antipsychoactive cannabinoid, CBD. Typically, smokers use glass bongs and water pipes to get the best use of these chemicals. The reverse is true for industrial hemp; when hemp was or is bred for its desirable industrial qualities, the percentage of THC is minimal, while the percentage of CBD is high. While marijuana has a potency range of 3% to 20% by dry weight of THC, industrial hemp is generally defined as having less than 1.0% THC, and the normal range is under 0.5%. These THC levels are so low that no one could get high from smoking it, according to this group. To receive a standard psychoactive dose would require a person to power-smoke 10-12 hemp cigarettes over an extremely short period of time. The large volume and high temperature of vapor, gas and smoke would be almost impossible for a person to withstand. Moreover, hemp contains a relatively high percentage of another cannabinoid, CBD, that actually blocks the marijuana high. Hemp, it turns out, is not only not marijuana; it could be called "antimarijuana." 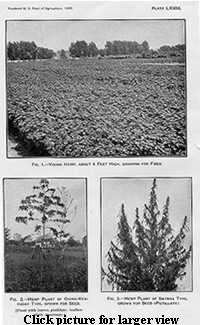 Feral hemp, or "ditchweed", is a remnant of the industrial hemp once grown on more than 400,000 acres by U.S. farmers. It also contains extremely low levels of THC, as low as .05 percent. It has no drug value, but does offer important environmental benefits as a nesting habitat for birds. About 99 percent of the "marijuana" being eradicated by the federal government-at great public expense-is this harmless ditchweed. Industrial Hemp is grown quite differently from marijuana. Hemp plants are cultivated inches apart to produce plants with tall stalks, while pot plants are short and spaced a few feet apart to produce bushy, THC-rich flowers and leaves. Moreover, they are harvested at different times. Marijuana cultivators also try to cull male plants to prevent fertilization of the female plant. Unfertilized females produce more THC, making it attractive as a drug (sinsemilla). In contrast, hemp production typically seeks fertilization to produce seeds. And cross-pollination between hemp plants and marijuana plants would significantly reduce the potency of the marijuana plant. If hemp does pollinate any nearby marijuana, genetically, the result will always be lower-THC marijuana, not higher-THC hemp. "The pot crop would always get weaker," Mahlberg said. If hemp is grown outdoors, marijuana will not be grown close by to avoid producing lower-grade marijuana. A pot grower would fear the inevitable pollen from hemp cultivation in a mixed plot, and would not hide his plant in industrial hemp fields. Likewise, extracting THC from industrial hemp and further refining it to eliminate the preponderance of CBD would require such an expensive, hazardous, and time-consuming process that it is extremely unlikely anyone would ever attempt it, rather than simply obtaining high-THC marijuana instead. All of this goes to show why, in countries where hemp is grown as an agricultural crop, the police have experienced no such burdens. In fact, there are over 30 nations on the planet currently growing industrial hemp. These include Canada, Australia, England, France, Germany, Austria, Spain, Russia, and China. The regulations established in these countries are simple: contract production, aerial ASCS type maps of fields, only government certified low THC seed, pre- and post-harvest field surveys, field checks on THC levels and an open field policy. And they do not have an increased problem with prosecution for marijuana use. So legalizing hemp would not burden local police forces. This explains why the National Conference of State Legislatures (NCSL) recently adopted a resolution strongly urging the U.S. Department of Agriculture (USDA), the Drug Enforcement Administration (DEA) and the Office of National Drug Control Policy (ONDCP) to collaboratively develop and adopt an official definition of industrial hemp.